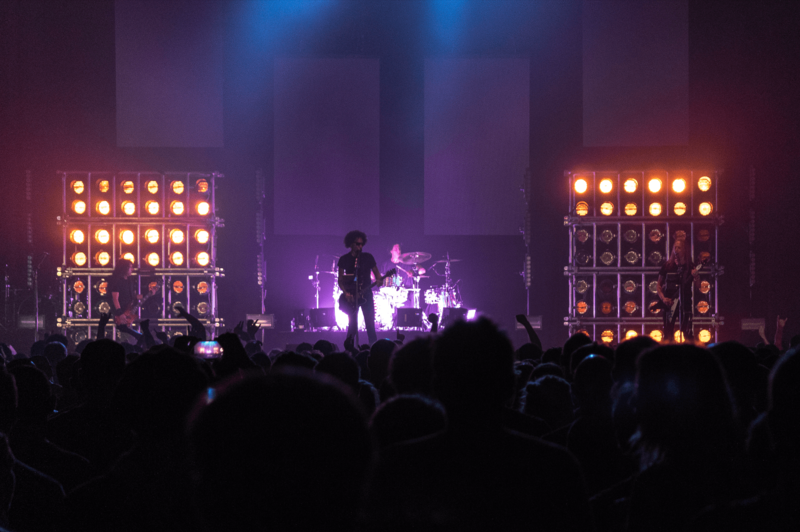 1000’s of grunge fans descended on Trust Arena in Henderson last night to witness Alice in Chains playing their first ever New Zealand show. Instrumental act Jakob opening the show and despite the lack of vocals, kept the crowd entertained and warmed them up for the main act. Alice in Chains arrived on-stage at 8:30pm and kicked things off with ‘Bleed The Freak‘ followed by their 2009 hit track ‘Check my Brain‘. The crowd was quite relaxed for the first few songs but clearly having a great time pacing themselves for the night ahead. Things started to heat up when the band played 90s favourites ‘Man in the Box‘ and ‘Down in a Hole‘. The intricate rhythms and heavy guitars kept people on their feet. It made for a nice change of pace when they slowed things down and played the ballad-like ‘Nutshell‘ which Jerry dedicated to original members Layne Staley and Mike Starr who both passed away. After getting the crowd pumped again with 2013 hit single ‘Hollow‘, drummer Sean Kinney stepped forward to chat with the audience. He explained how they were suppose to play in Auckland back in the 90’s but he was injured and they had to cancel the show to the dismay of older fans. While he was chatting the crowd began to notice a second drum kit being set up on stage and so Kinney joked that they were going to bring Justin Bieber out as a special guest. After a confused look from the crowd he laughed and explained that actually, the guests were Chad and Josh from Red Hot Chili Peppers! Roars erupted from the crowd as they were treated to ‘Them Bones‘ and ‘Dam That River‘ featuring half of the Red Hot Chili Peppers, which was a special moment that not many people get to witness in their life times. After the two songs, Alice in Chains exited the stage for a quick encore break and then returned, jokingly saying that they had to go to the ATM to get some cash out to pay Chad and Josh for playing with them. They are certainly one of the most crowd interactive bands that I have seen live, it’s refreshing to see other members of the band coming out to chat with the crowd, other that the lead singer. After their short break they kicked back off and played four encore songs, the second to last being ‘Would?’ which received massive cheers from the crowd and topped off the night with smash hit ‘Rooster‘. The band promised to come back soon, which I hope they do because it was an incredible night and it felt as though as had all been transported back to the 90s. No doubt people will be taking about this show for a long time.